Those are among key findings in the annual farm income analysis conducted by University of Minnesota Extension and Minnesota State in collaboration with the FINPACK Team and the Center for Farm Financial Management (CFFM). 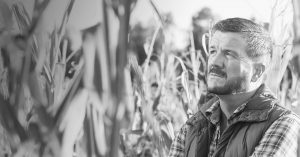 The analysis used data from 2,164 participants in the Minnesota State Farm Business Management programs and 104 members of the Southwest Minnesota Farm Business Management Association. Participating producers represent approximately 10 percent of commercial farmers in Minnesota. CFFM’s work with projects like this provide the benchmarking metrics used in FINPACK. The full FINBIN report on MN Farm Finances can be accessed here. For the third consecutive year, Minnesota farmers produced bumper crops of Minnesota’s primary cash crops, corn, and soybeans. But as has been the case each year, high yields did not produce high profits. 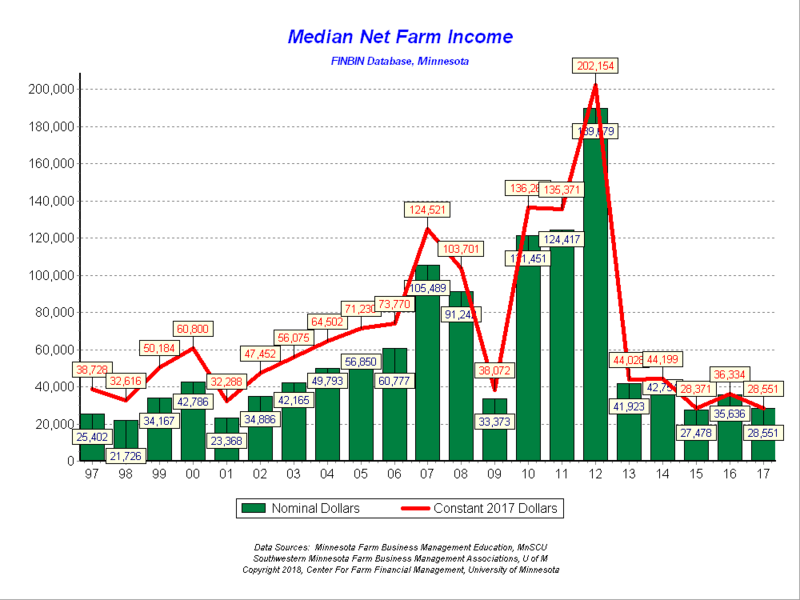 The median crop farm earned $23,722, down from $46,831 in 2016. Corn yields for these farms topped 200 bushels for the second year in a row, up almost 20% from the previous 10-year average. Soybean yields were not quite as good, averaging 48 bushels per acre but still 7% above the previous 10-year average. Large crops across the corn-belt as well as internationally have increased grain stockpiles and pushed prices below cost of production for a substantial number of producers. Corn prices averaged $3.25 per bushel for sales by these producers in 2017 after topping $7.00 per bushel just 5 years ago. The average producer lost almost ($25) on each acre of corn produced on rented cropland. Soybeans were a little better, with the average acre contributing $28 to farm profits. Yet, on average, balance sheets for crop producers remain relatively strong. The average crop producer’s earned net worth (excluding changes in asset values) increased by over $28,000. That increase, however, includes a contribution of almost $40,000 from off farm income. Working capital levels, which have been the savior of many of these farms throughout the current downturn, decreased by almost $28,000, but remained at a relatively strong 35% of average farm gross revenue. Profits were up for each of Minnesota’s major types of livestock operations, dairy, pork and beef production. Still the median producer earned only $32,800 from farm operations for the year. Hog producers had a big turn-around, after many lost money on pig production in 2016. For dairy and beef producers, however, profits remained at low levels by historical standards. The average dairy farm made $370 per cow, up from $135 in 2016. Milk producers received $17.94 per hundred pounds of milk (cwt), while production costs averaged $17.24. However, currently most producers are receiving under $15.50 per cwt. Pork producers were the only farms that as a group, had a profitable year in 2017. The median earnings for hog farms was just over $122,000 after losing almost ($5,000) in 2016. Pork producers received almost 55 cents per pound produced, up from just under 50 cents in 2016. The average farm made about $11 per head finished. Prospects for 2018 are cloudy, according to Purdue economist Chris Hurt. Much depends on feed cost which are now inching up, again because of corn production problems in South America. The median beef farm among this group of farmers lost money for the third consecutive year, netting a farm loss of ($3,800) in 2017 compared to a loss of almost ($12,000) in 2016. Enterprise returns, however, were much better. Cow-calf producers made about $17 per cow in 2017 after losing ($83) per cow in 2016. Cattle finishers, those who buy calves from cow-calf producers and raise them to market weight, made $137 per head, after losing ($77) last year. Cattle futures prices do not provide much optimism for improved profits for the beef sector in 2018. The statewide results are compiled by the Center for Farm Financial Management into the FINBIN database, which can be queried at www.finbin.umn.edu. The full FINBIN report on MN Farm Finances can be accessed here. FINBIN is one of the largest and most accessible sources of farm financial and production benchmark information in the world. FINBIN places detailed reports on whole farm, crop, and livestock financials at your fingertips. 2017 data will continue to be added this spring from other collaborating states, including Illinois, Michigan, Missouri, Nebraska, North Dakota, Ohio, South Carolina, South Dakota, Utah, and Wisconsin.